What is it? 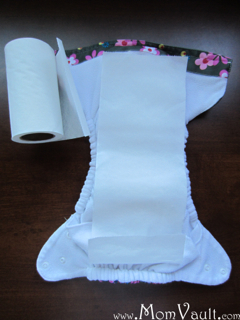 These are biodegradable liners that you can place in cloth diapers to catch solid waste. How does it work? Just put it in the cloth diaper! I tend to fold it down on the back because it's just a little long for the diapers (See picture). With each changing you can flush it right down the toilet! Cool Features: The perforation makes it easy to tear each sheet. The liners also stay surprisingly dry to the touch so it's not really gross when you have to help ease it into the toilet. This also helps keep my daughter's diapers much cleaner, I recommend using these even before solid foods are introduced! Practical Point: Solid waste is NEVER allowed to be disposed of in regular garbage, which includes both cloth AND disposable diapers! The landfills are not designed for composting, what's more it's is a rather major health issue. There are vague references by WHO and EPA on the matter but no Federal law that I can find to link at this time.